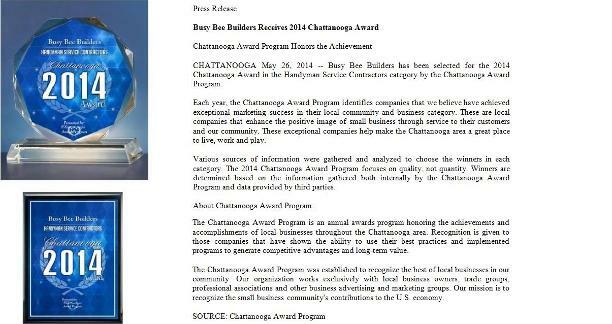 If you live in the Chattanooga TN or NW GA areas and are in need of repairs, look no further. Here at Busy Bee Builders "Handyman Connection" we pride ourselves on delivering the best handyman service that you can find. Our technicians have over 25 years experience and are professional, insured, and reliable, so you can feel carefree having us working in your home. Simply call us at (423) 622-BUSY(2879) or contact us using our online form on the "Contact us" page of our site, make one convenient appointment, and we’ll take care of everything on your “To Do” list. We understand your growing “To Do” list can feel overwhelming at times. This, along with busy work schedules, makes commitments to family and community difficult. We also understand you’re invested in the local area. 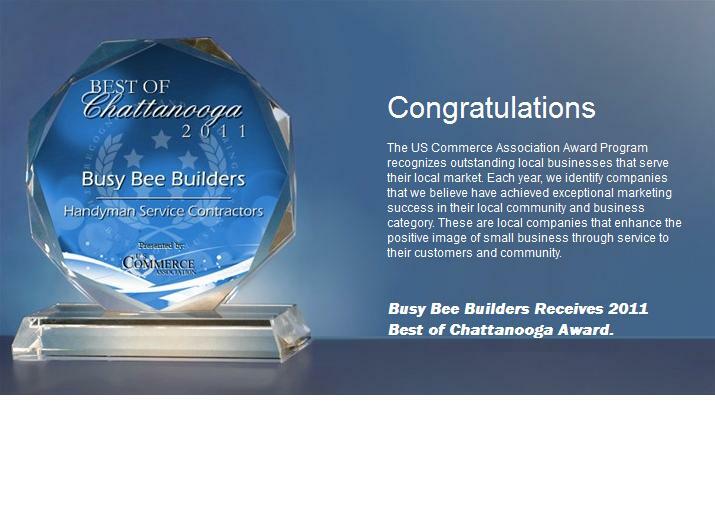 Busy Bee Builders does it all! Toilet repair, tub / shower caulking, gutter cleaning, appliance installation, locks and deadbolts. Do you need some carpentry? We do cabinets, counter-tops, molding, trim, shelving, ramps, decks, roof repairs and much, much more. How about grout, tile, floors, doors, walls, ceilings, siding, plumbing and electrical? We do that, too. We even do seasonal odd jobs such as pressure washing, weatherproofing and much more. Is there a job you need done that you don’t see here? Please give us a call!! 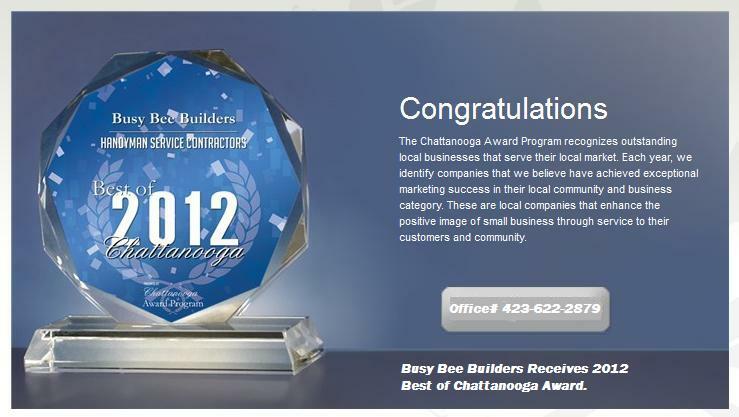 Busy Bee Builders would like to personally thank all our customers for their wonderful support!!! We just got our 2015 Award too thats 5 year in a row... See it soon right here!!! !